Rent a car in Spain with Sixt for an affordable way to explore this exciting country. With many branches in major cities and airports, you will be able to continue your journey in style and ease. Browse our branch locations to book one of our car rental deals in Spain. 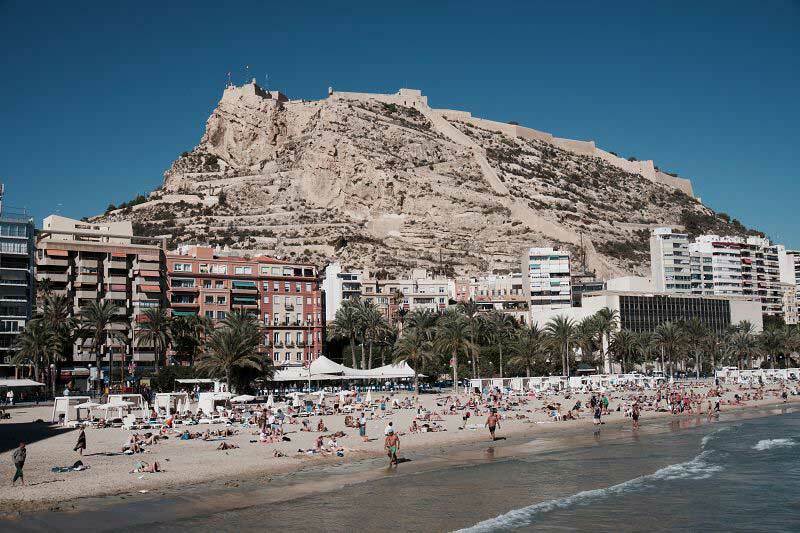 Whether you are renting a car on the mainland in top cities like Madrid, or are heading off on a vacation to the Canary Islands or one of Spain's Mediterranean islands we have locations to accommodate. Our online booking makes reserving the right rental car easy and provides a simple way to customize your car rental in Spain with any of our useful add-ons. Traveling to Spain in the winter means milder weather, but still plenty to do. You can head to Granada and go skiing in the Sierra Nevada mountains, and Toledo also offers ski hills. Madrid offers many indoor museums and other attractions and also has a well-known New Years Eve celebration. If you happen to be in Barcelona, there are many museums to see including one with the works of Picasso. The Three Kings Parade in Barcelona and the Magic Kings Parade in Madrid, both on January 5, are fun celebrations to behold. If you are planning to rent an SUV to go to any of the many ski resorts in Spain, make sure you check with the Sixt branch to see if they have ski racks and winter tires. Beware that the weather in the north can be in the 40s or below in the winter. Rent a car in Spain with Sixt and have your pick of leading brand vehicles. Our up-to-date fleet features a variety of car categories and models from world-class manufacturers such as BMW, Audi, and Mercedes- Benz. We host a diverse selection of economy and luxury rental cars so you are certain to find the right vehicle for your budget and plans. All of our rental vehicles are subject to regular maintenance and safety checks. We have optional features to customize your driving experience as well. Include extras like additional drivers, protection plans, GPS, child seats and more. Not to worry though, all of our car rental deals in Spain come with air conditioning so you will stay cool in the hot Spanish sun. Our compact city cars are ideal for maneuver through densely populated cities and are easier to park. A sedan is perfect longer road trips, offering top comforts and amenities. SUVs give you ample passenger and cargo space and minivans or passenger vans are great for group trips. To rent a car in Spain driving licenses must be presented on vehicle collection alongside a passport or identity document. We accept non-EU driving licenses if no visa has been entered in the passport, or if you have a visa in your passport but have been in Europe no longer than six months. Driving licenses in a non-Roman must be accompanied by an international driving license. For driving licenses from countries not part of the international driving license treaty, an official translation of the license must be presented with the original license. An IDP can only be obtained before you leave the United States from either the American Automobile Association (AAA) or the American Automobile Touring Alliance (AATA). Age restrictions in Spain depend on the vehicle category you choose and further information can be found during the online booking process. Generally, the minimum driving age is 18 and for drivers under 23 a surcharge applies. We accept payments from all internationally recognized credit cards including Airplus. We do not accept prepaid cards or debit cards such as VISA Electron. You must present your payment card when picking up your vehicle and it must be in the name of the driver. A deposit will be required on collection and the exact amount depends on your chosen vehicle and will be calculated when you pick up your car rental. Some of our special luxury cars and rental vehicles in specific car categories can only be hired with particular credit cards and sometimes Sixt credit/identification means are required. Please check the rental information on the booking page for more information. In the event of an accident, please inform the police immediately no matter whether the vehicle is only slightly damaged, the accident was self-inflicted or if no other vehicles were involved. In addition, any damages must be reported directly to Sixt during the rental period. Use the accident report form enclosed with the vehicle documents. Wherever you are in Spain you can call 112 for emergencies. It is not allowed to ship your rental car by ferry when renting from the Balearic islands in the Mediterranean or the Canary Islands. In addition, there are some restrictions on which EU countries you can travel to from the Spanish mainland, and these depend on the brand of your car. The permitted countries are divided into zones 1 and 2 while all other countries in zone 3 are not allowed, please check the Rental Information page. Most roads in Spain are excellently maintained. However, on some islands and smaller routes, you may find a reduction in quality along with gravel roads and dirt tracks. On highways, you have to pay tolls so have some cash to hand or pick up an electronic payment device at a gas station. On the spot fines are in force, especially for visitors, who are expected to pay for any penalties immediately. The national speed limits are 120 km/h (75 mph) on motorways and dual carriageways, 100 km/h (60 mph) on roads with more than one lane in each direction and 90 km/h (55 mph) on normal roads. In built up areas follow the speed limits as signposted. Generally at intersections you give way to the right. At roundabouts drivers at the roundabout have priority over approaching vehicles. You can only use your horn in extreme circumstances and in some areas it is forbidden completely. The legal alcohol limit is 0.05%, if there is an accident all road users must take a breath test. Steeped in history La Alhambra de Granada began as a fort in 889 AD and was transformed into a stunning palace by the Nasrid dynasty in the 1300s. It is a huge complex and extremely popular with tourists, its rich and varied history evident in its extraordinary architecture. A more contemporary architectural marvel is the Museo Guggenheim in Bilbao. The building is admired internationally and exhibits many impressive large scale installations by contemporary artists. The Acueducto de Segovia is one of the best preserved Roman aqueducts in Europe and is believed to have been finished in 112 A.D. The aqueduct is in the Old Town of Segovia and continues to draw large crowds. La Sagrada Familia in Barcelona was designed by the famous architect Anton Gaudi and is still under construction over 90 years after his death. It is one of the most extraordinary buildings in Barcelona, most of the cathedral can be visited including the huge Passion and Nativity Towers. The Parque Nacional del Teide in Tenerife is the most popular national park in Spain with over 3 million annual visitors. It's most important geological feature is the Teide, an active volcano that is the highest point in the whole of Spain at 3,718 meters. The Espacio Natural de Doñana, or Doñana National Par, in Andalusia is a natural reserve that has a broad range of outdoor activities including surfing, walking and cycling. The area boasts an impressive array of flora and fauna, beautiful sand dunes, riverside forests, and excellent bird watching. The Parque Nacional de Cabañeros in Castilla-La Mancha contains the largest surviving area of Iberian Mediterranean forest and is home to notable species including the Eurasian Black Vulture and Spanish Imperial Eagle. For mountains, the Parque Nacional Picos de Europa is superb for camping and hiking. The Naranjo de Bulnes (Picu Urriellu in Asturian) is one of the most impressive peaks in the area with its 550m vertical limestone wall.